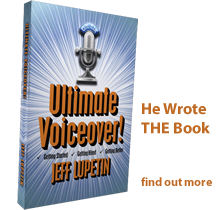 Hi, I’m voiceactor Jeff Lupetin and welcome to jeffsvo.com. This site features a variety of quick samples of my commercial voiceover work as well as my original spoken word audio comedy. I created this site with you in mind, to make your job easier during voice casting. Have fun and thanks for stopping by. I look forward to working together soon. Check-out the new Bit-of-the-Month, "Dangertown"!